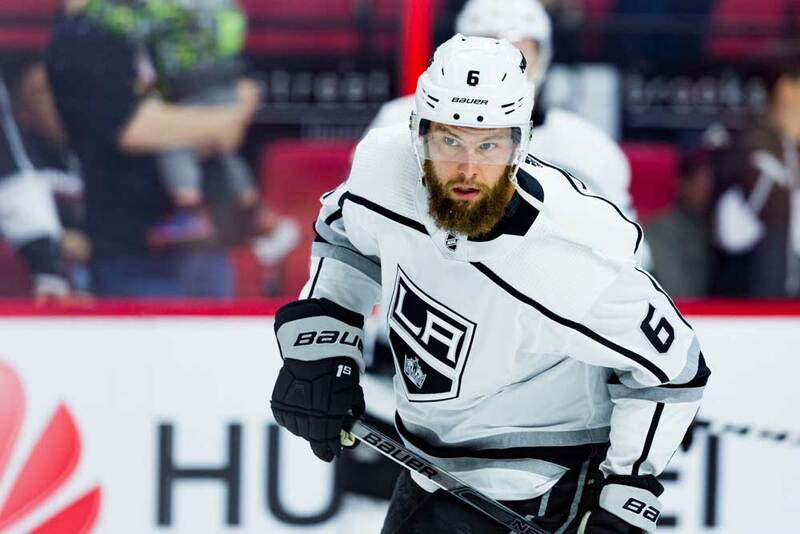 With a playoff spot anything but guaranteed, the Toronto Maple Leafs pulled the trigger on a trade just after the All-Star break by acquiring veteran defenseman Jake Muzzin from the Los Angeles Kings. Muzzin didn’t come cheap as the Leafs gave up their 2019 first-round draft pick along with minor-league forward Carl Grundstrom and the rights to defenseman Sean Durzi, who’s an unsigned draft pick. A quick look at the stats shows the 29-year-old Muzzin of Woodstock, Ontario has racked up four goals and 21 points in 50 games this season. He’s appeared in 496 regular-season outings with 51 goals and 162 assists to his name for 213 points and has a plus-24 rating. He’s also chipped in with seven goals and 20 points in 50 postseason contests and helped the Kings win the Stanley Cup in 2013/14. Muzzin was drafted by the Pittsburgh Penguins originally as they took him in the fifth round in 2007 with the 141st overall pick. He failed to come to a contract agreement though and signed with the Kings in January of 2010. As for Grundstrom, the 21-year-old native of Sweden was selected in the second round of the 2016 draft with the 57th pick overall and then signed an entry-level contract with the Leafs. The winger remained in Sweden on loan with Frolunda HC and joined the Toronto Marlies of the AHL in the 2016/17 playoffs with three goals and an assist in six games. He returned to Sweden for the 2017/18 campaign and notched 17 goals and 24 points in 35 games. Grundstrom flew back to Toronto at the tail end of last season and registered a goal and two assists in a pair of contests. He then scored eight goals and 14 points in 20 playoff games to help the Marlies win the Calder Cup Championship. Grundstrom had contributed 13 goals and 29 points in 42 outings with the Marlies this season. The Kings also picked up the 20-year-old Durzi of Mississauga, Ontario. The defender was drafted in the second round with the 52nd overall pick in 2018, but has yet to sign a contract. Durzi has split this season with the Owen Sound Attack and Guelph Storm of the Ontario Hockey League and has notched eight goals and 28 points in 26 games. With the NHL season entering the final stretch it means Muzzin’s salary-cap hit is just under $1.5 million for the rest of the campaign. However, he’s under contract until the end of 2019/20 and his salary-cap hit is $4 million for next season. With the Leafs needing to sign restricted free agents Auston Matthews, Mitch Marner and Kasperi Kapanen it means more moves are going to be made. Veteran blue liner Jake Gardiner has recently been made a scapegoat by many fans and he’s scheduled to become a free agent in the summer. Gardiner’s a high-scoring, offensive-minded rearguard who’s just 28 years old, but with only two goals and 24 points so far this year he’s outscoring Muzzin by just three points. Gardiner’s expected to garner bids of about $7 to $8 million if he tests the free-agency waters and it’ll be hard for the Leafs to fit him in under the salary cap. They could now trade him before the deadline and ultimately save a few million compared to Muzzin’s salary. It was believed Toronto general manager Kyle Dubas might pull of a trade, but most experts thought he was looking for a right-handed shot on the blue line, whereas Muzzin shoots left. Dubas might try to peddle the underachieving Nikita Zaitsev to free up another $4.5 million in salary if he wants to make a concerted effort at keeping Gardiner. Much has been made of the Leafs’ defensive shortcomings, but the team’s lack of consistent scoring has been it’s major downfall. The squad is capable of scoring six goals one night, but then struggles to find the back of the net more than twice the next night. Players such as William Nylander, Nazem Kadri, Patrick Marleau, Connor Brown, Matthews and Gardiner have all endured lengthy goal-scoring slumps this season while Marner and John Tavares have been pulling their weight on a regular basis. Muzzin should help solidify the blue line and head coach Mike Babcock can cut down veteran Ron Hainsey’s minutes. In addition, Gardiner’s status is unclear at the moment as he missed the two games prior to the All-Star break with back spasms. If he’s going to be sidelined for several weeks the trade makes a lot of sense. Dubas gave up a first-round pick, but he didn’t lose a roster player in the deal which means it’s all hands on deck if the team can nail down a playoff spot. Fans shouldn’t expect Muzzin to become the team’s saviour though as he’s not exclusively a shutdown defenseman. The Leafs need a physical defensive blue liner such as Hall of Famer Scott Stevens to tighten up in their own end whereas Muzzin is more similar to Gardiner, but perhaps with fewer giveaways per night. Dubas has improved his roster with the trade, but the current Leafs’ team is still arguably too weak and inconsistent to do much damage in the playoffs. On the bright side, the GM now has the option of making another trade or two if he can find the right dance partner and if he can address the team’s other weaknesses. A power forward would definitely help their playoff chances if Babcock continues to stifle his players’ creativity with his coaching tactics. The Leafs’ power-play has suffered due to predictability and the stretch pass is relied on far too often. This can easily be defended by clogging up the neutral zone. The talented Toronto players would be better served utilizing their skills by carrying the puck into the opposition’s zone rather than dumping it in and chasing it. Babcock’s the man behind the bench though and it’s typically been his way or the highway throughout his career. As far as Los Angeles is concerned, the team has been struggling all season and needs to get as much as possible in return for its ageing veterans. However, Muzzin didn’t really fit that bill at the age of 29. Still, Kings’ GM Rob Blake has added some youth in the deal with a 20 and 21-year-old as well as an upcoming draft pick. He now needs to sign Durzi if he feels he’s a potential NHL’er. This could end up being a fine trade for the Kings as both Grundstrom and Murzi are good young prospects and this summer’s first-round draft pick could eventually become a high-impact player. The Leafs have improved immediately while the Kings made the deal with the future in mind. It’s going to take a few years to see if there was a winner, but Muzzin will need to be re-signed or moved on before free agency in 2020 for Toronto to have any chance of claiming victory here.